Tony Stark allows one Iron Man armor to be used by the US military under the auspices of his close friend, Air Force officer Lieutenant Colonel James Rhodes. Heavily armed with Hammer Industries weaponry, "Rhodey" is the armor's sole pilot. War Machine apparently lost weight between movies, because this armor is much less bulky than the last one. Of course, he did a lot of things between movies, including being busy on the other side of the planet, so stop asking why he wasn't in Avengers already! 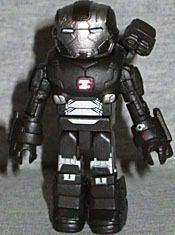 Although War Machine didn't appear in Iron Man 3, concept art was created for him, and this Minimate is based on that. The chest cap only comes down to mid-torso, and the upper arms are new molds. The gloves and boots are new, and you can remove his helmet to reveal Rhodey's face beneath. In fact, you'll have to if you want the cannon on his shoulder to sit straight - the helmet's really big! The grey of the suit is so dark that it's nearly black. An old colleague and romantic interest of Tony Stark's, Maya Hansen was more interested in the biological side of science than the technological, and she ultimately developed the Extremis formula that could turn a human into a living weapon. Despite being about the same age as Tony, Maya Hanser dresses like she's in college. 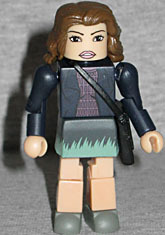 This is the outfit she was wearing when she dropped by his house (10880 Malibu Point): a dark jacket, maroon shirt, and a skirt that in the movie was a faded partially floral print over black and white, but the toy just treats as a black skirt with green around the lower edge. It's not a direct match, but it's a good effort. Her feet are grey with pale stripes on the sides because she wears Adidas. Her bag is slung across her chest, and we actually get an approximate likeness of actress Rebecca Hall. This entry was posted in Art Asylum, Marvel, MMMR, TRU and tagged Iron Man, Minimates. Bookmark the permalink.